FRANCIS – Stephen Joseph (Joe), 95, of Milton, passed away on August 6th, 2010 in Queens General Hospital, Liverpool. Born on September 16th, 1914, in Milton, he was a son of the late Andrew and Addie (Lowe) Francis. Joe was a long time resident of Milton and employee of Bowater Mersey Paper Company until his retirement in 1976. He was a veteran of World War II serving with the West Nova Scotia Regiment from 1939 -1945. Joe was an avid salmon fisherman and spent many hours fishing with his sons on the Miramichi and Tobique Rivers. Joe is survived by his daughter Karen (Robie) MacRae ; his sons: Allen (Jeannita) and Joseph (Delphine “Gerry”). His daughter-in-law Shirley Francis. His grandchildren: Melanie (Nicholas) Matulonis, Jonathan (Dawn) Francis, Julie (Shawn) D’Arcy, Allen (Carla) Francis. Grandson-in-law Michel Parent. Great grandchildren Shae and Max D’Arcy, Kristie Chase, Maggie and Callie Francis. 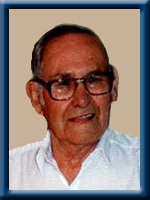 He was predeceased by his wife Geraldine C. (Glode), his son Max, granddaughters Connie Chase and Lisa Parent. Sisters Grace Wentzell and Evangeline Pictou and brothers John and Peter. Visitation will be Tuesday, August 10th, 2010 from 2 until 4 p.m. and 7 until 9 p.m. in Chandlers’ Funeral Home, Liverpool. Funeral Mass will be Wednesday, August 11th, 2010 at 11:00 a.m. from St. Gregory’s Catholic Church, Liverpool, Father Joseph Christensen officiating. Burial will be in St. Gregory’s Catholic Cemetery, College Street. Family flowers only, donations may be made to any charity. Online condolences may be made to www.chandlersfuneral.com. They that love beyond the world cannot be separated by it. Death cannot kill what never dies. Our deepest sympathies to you all. Yvon and I are so glad that we went to visit Joe in December 2009. It was Boxing Day. (Karen, I am not sure if you knew that.) He did recognize Yvon after a bit of reminiscing. We stayed for about a half hour. We are planning to attend the funeral on Wednesday. See you then. Please let me know if there is anything we can do or bring. So sorry to read about the loss of your Dad in today’s paper. He’s had a remarkable life – think of changes he has seen in the past 95 years. I know you valued the time he spent in the U.S. – you were very blessed to have had him for so long. My deepest sympathy goes to you, Robie, Melanie (& Nicholas) and your family. I hope the memories you have of your Dad will help to comfort you all in the days to come. We were very saddened to hear of the loss of your dear father Joe. Please know that our love, thoughts and prayers are with you during this difficult time. Time cannot steal the treasures we carry in our hearts. Uncle Joe will always be remembered .